A sleek and slim line 1950's inspired floral design women’s cross body bag. Keep all your essentials to hand in the two outer zip pockets. Inside is a secure inner zip pocket; the top also has a zip closing. 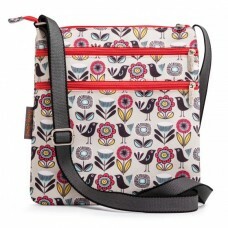 The bag has a gorgeous contrasting geometric printed lining and a stylish adjustable shoulder strap. It is made from a super hard wearing polyester canvas and is machine washable and colourfast.